The Fellowship was fortunate enough to obtain a copy of GRIMM FAIRY TALES #123 from Zenescope Entertainment. Pat Shand writes, Salvatore Cuffari draws, Erick Arciniega colors, and Ghost Glyph Studios letters. Bloody Bones has somehow placed the town into a magical sleep, and it’s up to the students at Arcane Acre to try to stop him. One quick looting run through the school later, they’re on the road, with former Mad Hatter Violet in tow (she seems pretty nice now, though). They’re pretty sure Bloody Bones hasn’t finished his preparations for whatever he’s planning, but there are still a few dangers in the path to the end. This issue marks the beginning of the end of Zenescope’s longest-running series. And while the big guns are spread across the multiverse moving the chess pieces into place (not literally), the kids are left to handle their end on their own (though they seem ready for the challenge). It looks like we’re going out with a big bang of a story here, and the art is very much up to the usual Zenescope high standards. This series has been the foundation for their magical supers and dimensional horror stories for many years now. Come check out the end of an era (and maybe get some hints as to what comes after). 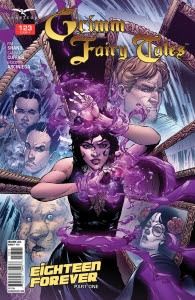 GRIMM FAIRY TALES #123 is available now at your FLCS or at zenescope.com.